I just received a letter in the mail that it’s time for Stetson to return to the Guide Dogs of America for his formal training in Sylmar, CA. I’m sad and happy at the same time. It’s going to be difficult letting Stetson go on to the next stage of his life. However, this is exactly what we’ve been working towards over the past year. I think of it as Stetson graduating high school (his training time with me) and moving on to college at GDA. Of course when he graduates college he’ll move on to his career hopefully as a guide dog. If he doesn’t make it as a guide dog then he can be career changed to life as a pet, therapy dog, search and rescue, or possibly some other type of working dog. If Stetson comes back to me as a pet I’ll do my best to get Stetson trained as a therapy dog. In order to successfully complete guide dog training and become a useful mobility aid to a blind person, a dog must meet certain physical and temperamental requirements. Any obvious disqualifying fault that the general public would be able to notice about any breed that GDA uses. Many dogs will display some of these in the very beginning but the instructors will work with them, giving them evey possible chance to show improvement. If the undesirable characteristic continues or increases, it will be necessary to terminate the dog’s training. Many times, a dog will improve and reach a point that the original problem was eliminated. Some dogs will start with no concerns but with added pressure of learning to become a guide dog, will manifest the undesirable behavior. We try to give each dog as much individual time, effort, and opportunity to succeed in becoming a guide dog, but we must adhere to a work standard that will give each blind person the best possible mobility aid through their guide dog as possible. Our ultimate goal is to get Stetson to be a full fledged guide dog. However, if he doesn’t choose to be a guide dog we will welcome him back home and get him (hopefully) involved with therapy dogs. Stetson will be heading to the GDA campus in Sylmar, CA on May 10th to start his formal guide dog training. 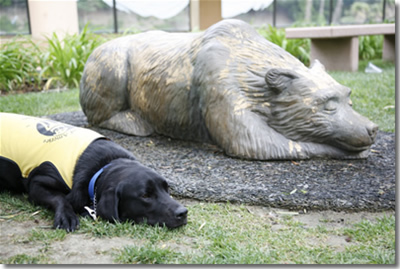 Have you raised a guide dog, service dog, or any kind of working dog? Do you have any pointers for me when I drop Stetson off at the GDA campus? That is beside bring a lot of tissues. Wow, already going IFT? Best of luck and I will be there for your graduation. I overheard our area leader talking to another puppy raiser about turn in day and one thing she said was it difficult when they said to remove all personal tags so you might want to remove those before. Definitely take off the tags. Take lots of pictures, or have someone take pictures of you and Stetson right before you hand him over. I have a picture of me and my family and Arturo that was taken at the GDB kennel about 4 minutes before I turned Arturo in, and I treasure it so much. Turning Arturo in didn’t really hit me until I got home, and clanking his dish didn’t cause a big 75lb puppy to run into the room. It’s not easy, but it sounds like you have the right perspective. It sounds like you’ve done a fabulous job with Stetson, and you should be proud of your hard work. Don’t be afraid of asking other people to borrow their puppies if you’re missing having a dog around. There’s nothing like puppy therapy to get you over turning in your buddy. And don’t be afraid to cry. And feel free to have dozens of posts about Stetson, even once he’s gone. We understand. @Tonka & James, yeah he’ll only be 16.5 months old when he goes in for training. I’ll make sure I remove his tags beforehand. @Anne, thanks for the vote of confidence. I’ll do my best! @Anna & Lawrence, thanks for all the great advice. I’m already set to puppy sit a couple weeks after Stetson goes in for training. I have my parents joining me on Stetson’s turn in day, I’ll make sure they take plenty of pictures. @Erin, luckily I have another pet dog that will probably miss Stetson as much as I will. I thought the disqualification for appearance was interesting too. I keep coming back an reading your blog- all out of sequence too! My Volt is 29 weeks old tomorrow, and will most likely go back to the South African Guide-dogs around Halloween. We turned in Dublin right before last Halloween. We here that Apache will be starting his formal guide dog training in July, but haven’t received the official word just yet.